(l-r) Sarah Paulson, Sandra Bullock and Rihanna star in OCEAN’S 8. ©Warner Bros. Entertainment. CR: Barry Wetcher. To dismiss “Ocean’s 8” as just a female “Ocean’s Eleven” isn’t giving the fun-filled caper the credit it so rightfully deserves. 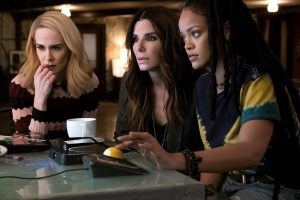 A worthy addition to the modern era “Ocean’s” franchise, which began in 2001 with director Steven Soderbergh’s remake of the classic 1960 Rat Pack film “Ocean’s 11” (Soderbergh serves as a producer this time around), “Ocean’s 8” is just as star-studded and entertaining as its male-driven predecessors. Not a remake by any means, the film actually ties into Soderbergh’s heist trilogy, as its main character, Debbie (Academy Award winner Sandra Bullock, “The Blind Side”), is Danny Ocean’s (played in the previous films by George Clooney) estranged sister. Viewers quickly find out that the two siblings have a lot in common, as Debbie is a professional con artist/thief, too, who is currently serving time in prison after being set up by her art gallery curator boyfriend, Claude Becker (Richard Armitage, “The Hobbit” franchise). After conning her parole board officer to release her, Debbie reunites with her former partner, Lou (two-time Academy Award winner Cate Blanchett, “Blue Jasmine” and “The Aviator”), to pull off the perfect crime—which of course she ironed out all of the details for while sitting in prison for exactly 5 years, 8 months and 12 days. To pull off the heist, Debbie and Lou assemble an all-female crew to rob a Cartier diamond necklace worth $150 million right off of celebrity Daphne Kluger’s (Academy Award winner Anne Hathaway, “Les Miserables”) neck during the annual Met Gala because, as Debbie points out, “A him gets noticed. A her gets ignored. And, for once, we’d like to be ignored.” Included among the all-female crew is a disgraced designer who will get the Cartier necklace and dress Daphne for the Met Gala (two-time Academy Award nominee Helena Bonham Carter, “The King’s Speech” and “The Wings of the Dove”), a mysterious hacker (nine-time Grammy Award winner Rihanna, “Home”), a diamond expert (six-time Emmy nominee Mindy Kaling, “The Office”), a street con artist (Awkwafina, “Neighbors 2: Sorority Rising”) and one of Debbie’s other former partners (Golden Globe winner Sarah Paulson, “American Crime Story: The People v. O.J. Simpson”): a suburban housewife who still has a knack for stealing things. 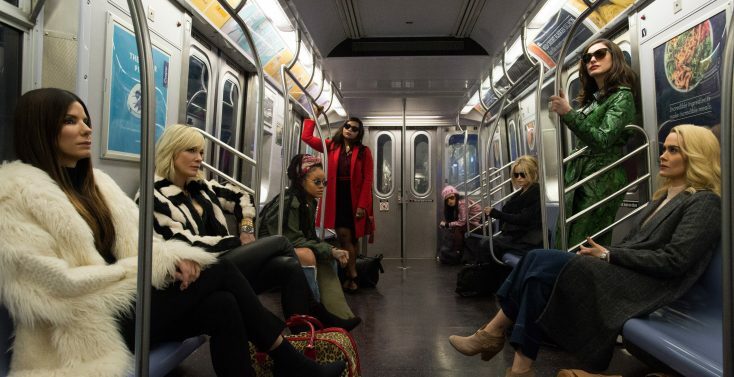 If you’re keeping track of how many people are on Debbie’s crew, you’ll notice she’s still one shy of the titular “Ocean’s 8,” but the final person remains a surprise until the end of the movie (albeit a predictable one). What follows is a clever, fast-paced film as Debbie and her crew try to walk off with $150 million—and set up Debbie’s scumbag ex in the process. While “Ocean’s 8” may not win any major awards, audiences will have a blast watching the fun popcorn flick. Director Gary Ross (“Seabiscuit”), who also co-wrote the film with Olivia Milch (the upcoming “Barbie” movie), delivers an action-comedy that’s just as smart and sleek as Soderbergh’s original trilogy, if not even more so given the stylish setting of the “Ocean’s 8’s” heist. To say the majority of the costumes in the film by Sarah Edwards (“Salt”) are breathtaking is an understatement, as the crew working behind the scenes of “Ocean’s 8” truly brings the Met Gala’s fabulous fashions to life. What makes the film shine isn’t the $150 million necklace at the heart of its story but the attention to detail, which includes having a star-studded cast of blink-and-you’ll-miss-them Met Gala attendees—everyone from Kim Kardashian West to Heidi Klum—to make it seem like the real Met Gala is taking place. When viewers see Daphne Kluger’s name near Katie Holmes’ on the Met Gala seating chart they might not think anything of it, but later on in the film, there’s the “Dawson’s Creek” alumnus sitting right by Debbie Ocean’s target. Probably the best thing about “Ocean’s 8,” though, is that the movie not only leaves audiences eager to see future franchise installments featuring the all-female cast, but may also leave them wondering about the “Ocean’s Eleven” crew and where they are today. It’s almost disappointing that not all of the original characters come back this time around, particularly one character whose fate is teased throughout the movie but never really confirmed. Moviegoers will definitely leave the theater hoping to see more from both crews in the future—or perhaps even a movie where both the men and women team up. Ultimately, “Ocean’s 8” is the ideal summer blockbuster. It’s fun, it’s smart, it’s exciting, it has tons of star power and it proves that—at least when it comes to Hollywood heist films—anything a man can do a woman can do just as well. ‘Bad Santa 2’ is Even Naughtier on Home Video with Unrated Blu-ray Release … plus a giveaway!